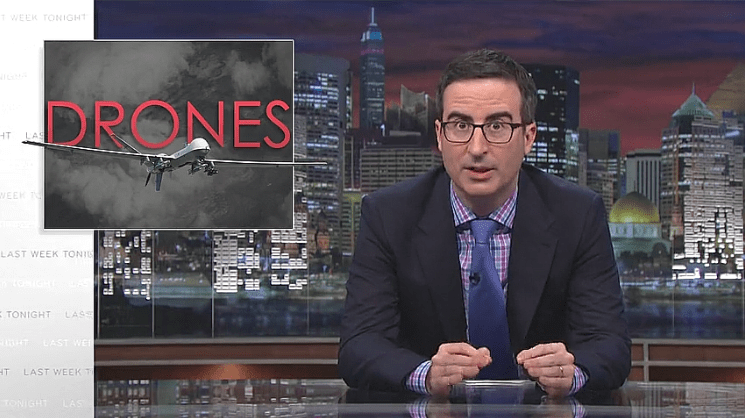 John Oliver did a segment on Drones everyone needs to see. Every so often I see ‘Independent’ publications like The Huffington Post or established outlets like The Washington Post make entire articles about the very relevant stories that the likes of Jon Stewart and John Oliver bring to us. Unfortunately those outlets prefer to focus on the quite obviously less relevant stories. Like what the latest talking head on FOX News said, Or what the latest thing Justin Bieber did was or exactly how Canadian our drunken, crack smoking Toronto Mayor is. This segment on John Olivers ‘Last Week Tonight‘ is much more relevant and even made me have a ‘Holy Sh*t’ moment, and I’ve been paying attention to these issues for some time. At the time of writing that segment, On YouTube alone, has 2,228,059 views. Perhaps you noticed what I noticed. What Oliver has done is scour the Internet and discovered some absolute gems of extreme negligence and legal culpability on the US Governments Drone program. Now anyone that has been following these issues knows that the US Government routinely kills innocent women and children and otherwise ‘definitely not a terrorist’ non-combatant civilians. (Not at all unlike what Israel does to Palestine) But what Oliver has unearthed is a tacit almost candid admission that the US Government has next to no bloody idea exactly who it is it is killing — but they ‘are definitely an appropriate target’ — even if they cannot prove in any manner, shape or form that the people they just damn well killed have any tangible connection to Terrorism whatsoever! Question: When can we expect the Pentagon to release either the photographs or the videotape of this site and some of the evidence that was gathered? Ms. Clarke: I don’t know. Question: May we make that as a request? Ms. Clarke: You can certainly make that as a request. Question: Do you have strike imagery? Ms. Clarke: We don’t know exactly who it was. Adm. Stufflebeem: We don’t know the identities of the individuals involved. Question: But you’re convinced they’re Taliban? Ms. Clarke: We’re convinced it was an appropriate target, based on the observation, based on the information that it was an appropriate target. We do not know yet exactly who it was. Question: And I’m curious. In this uncertainty, why would you attack this with a missile, as opposed to going in with a Special Forces team, perhaps surrounding the area, and trying to find out who was who, rather sending the missile? Wouldn’t that be a more proper way to do this, perhaps? Adm. Stufflebeem: Well, if you — in fact you have a quick reaction force that is on standby, in close proximity, and where vehicles have stopped and congregated, and people have gotten out and are having a meeting, if you have a team that’s ready to pounce, maybe so. If because of the location of where it is and because of the type of a system that you’re using to monitor these areas, you don’t have that, and you have the information that would lead you to believe that this — the time to be able take advantage of this would be now, rather than lose it — I think this was probably the best weapon that was available at the time in the location. Question: Were you afraid these people were going to get away? I mean, you had them under surveillance. Why wouldn’t you just instead go in and make sure you know who’s who? It could be scrap deals, it could be Taliban, it could be civilians. Ms. Clarke: I’d say, again, based on the information they had and the observations, they believed it was an appropriate target. And again, we’re somewhat at a disadvantage here, since it was not DoD per se. But they thought it was an appropriate target, and they used what they had at the time. Other instances of clearly very innocent people being executed en masse by the US Government is evidenced by this Dec. 2013 case as reported by DemocracyNow. “Human Rights Watch has revealed as many as 12 civilians were killed in December when a U.S. drone targeted vehicles that were part of a wedding procession going toward the groom’s village outside the central Yemeni city of Rad’a. According to HRW, “some, if not all those killed and wounded were civilians” and not members of the armed group al-Qaeda in the Arabian Peninsula as U.S. and Yemeni government officials initially claimed. The report concluded that the attack killed 12 men, between the ages of 20 and 65, and wounded 15 others. It cites accounts from survivors, relatives of the dead, local officials and news media reports.” Turning a Wedding into a Funeral. Or this report from the UK Telegraph that details no less than 168 children and as many as 775 innocent civilians executed by the US Government for happening to live in the wrong Country. “In an extensive analysis of open-source documents, the Bureau of Investigative Journalism found that 2,292 people had been killed by US missiles, including as many as 775 civilians. The strikes, which began under President George W Bush but have since accelerated during the presidency of Barack Obama, are hated in Pakistan, where families live in fear of the bright specks that appear to hover in the sky overhead. In just a single attack on a madrassah in 2006 up to 69 children lost their lives. Chris Woods, who led the research, said the detailed database of deaths would send shockwaves through Pakistan, where political and military leaders repeatedly denounce the strikes in public, while privately allowing the US to continue. “This is a military campaign run by a secret service which raised problems of accountability, transparency and you have a situation where neither the Pakistanis nor Americans are clear about any agreements in place and where the reporting is difficult,” he said. If you would like to learn more about the potent illegality of America’s War on Terror. A documentary film by Jeremy Scahill entitled ‘Dirty Wars‘ is a great primer on the subject.